We all have both feminine and masculine energies. Men must learn to nurture and women must decide and act. At midlife men and women are often at cross purposes. Two final aspects of personality remain for consideration in regard to midlife development. Jung postulates that each individual has both masculine and feminine components of the psyche. For a male the feminine component is the anima, and for a female it is the animus. Part and parcel of human biological and psychological development is this mixture of masculine and feminine energies. These energies are theoretical constructs or concepts, which are useful for explanation but are not identical with gender. The separation of these concepts from gender is very difficult to maintain in the English language because of the similarity of words. Masculine energy and male and feminine energy and female seem to be the same but are not. The concepts may be better understood if viewed from a different context. In Eastern cultures the Tao symbol with its Yin and Yang energies is expressive of the same idea. 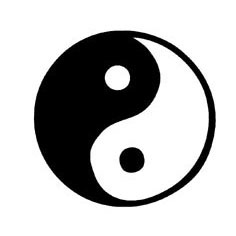 The Tao symbol, consisting of a circle divided in two equal portions each containing an element of the other, indicates that all of creation is composed of two energies held in harmony and interaction. The Yang energy is masculine in nature and is described as light, dry, directed, focused, logical, and action oriented. Yin energy is feminine and described as dark, moist, diffuse, vague, intuitive, and receptive. In regard to psychological functioning, men are predominately yang but contain a yin aspect. Women, while predominately yin, contain an element of yang. Thus human beings are psychologically androgynous with latent inner masculine and feminine energies awaiting development. In the first half of life a differentiation of the primary sexual identity and corresponding energy takes place but in later life a call to integrate the opposite energy, the anima or the animus, arises. This is a move towards wholeness. At the most basic and simplistic level what happens is that men begin to develop their capacity for relationship and must come to terms with emotions, vulnerability, and needs while women begin to become more decision and action oriented and in the process claim their independence, courage, power and wisdom. At midlife women are called to decide and do while men are called to nurture. This is process is seen in what Gail Sheehy in her book, Passages, refers to as the "switch forties". This is the time in midlife when men in the roles of husband and father begin a return to the values of home and family. They are drained from their years in the work world. At the same time that women as wives and mothers whose children are leaving home begin to experience a pull to the world of work. A switching of roles is taking place but may not be recognized as such. A woman who has been in the care-taking role begins to want to establish her own independence through action and accomplishments. An impetus is provided to seeking employment, education, or career. At the same time a man had often has enough of work and career. He recognizes the stifling effect on his personal development. He now needs to open himself to relationships and emotions, but when he does, he finds no one at home. The children are now increasingly independent and on their way out of the family by way of work or college. His wife who may have eagerly sought his companionship when he was "too busy" now is after a business of her own. The potential for significant relationship conflict arises as these two people are crossing paths on different trajectories. They are moving towards the earlier interests of the other. Each person is in the process of integrating the opposite masculine or feminine energy. Men must incorporate the inner feminine with its call for relatedness while women must respond to the inner masculine and the need for action. The anima and animus can influence a person in either a positive or negative manner. If a man is under the influence of the positive anima he will show tenderness, patience, consideration, and compassion. The negative anima manifests as vanity, moodiness, bitchiness, and sensitivity to hurt feelings. A woman with a positive animus shows assertiveness, control, thoughtful rationality, and compassionate strength. The negative animus reveals in strong opinions, ruthlessness, destructive forces, and "always the last word". Both men and women are on the path to their own integration and must struggle with the interpersonal ramifications of the anima and the animus. This process can be complicated by cultural influences. The impact of the early womens movement motivated women to leave the home for the work place. In doing so, these women had to take on a traditional masculine role if they were to succeed. They had to become competitive and more assertive. They had to internalize their emotions and be more "logical." As a result, these women at midlife may find that they have already developed the animus or the masculine energy. What they need to do is to integrate the feminine back into their lives. The men who have worked at being "liberated" have developed their feminine side and may need to catch up on the masculine. The "Wild Man" of the recent mens movement may be the symbol of recapturing the masculine energy. When it comes time to integrate the opposite energetic component you may have to do careful review of where you are in the individuation process before identifying the task ahead. The basic question is, "What is the current balance of the masculine and feminine energies in your life and what needs further development? What is Required to Become Whole?